Stopover in Epernay: studio near the city center. 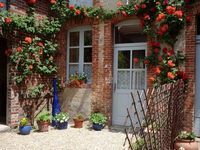 Property 17: Stopover in Epernay: studio near the city center. 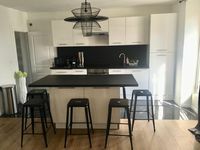 A comfortable newly renovated boutique apartment in Central Epernay. Property 26: A comfortable newly renovated boutique apartment in Central Epernay. Property 30: Charming F2 fully furnished quiet. Property 37: Modern rural cottage located in the Marne near Vitry le François. Hyper-center room Epernay "Yellow card"
Property 46: Hyper-center room Epernay "Yellow card"
Great location to Ave de Champagne, restaurants, shopping. All took less than 10 min walk. Apt is very neat, clean and comfortable. We were 2 couples staying in Epernay for the first time. 2 separate bedrooms &amp; baths were appreciated. Kitchen stocked for our basic needs- breakfast and light dinner. Downside: 3 flights of stairs with luggage. There was not one bit of information on the apt and how to use appliances; no folder or drawer with any recommendations on things to do, places to see or go. Never had that in all of the places we have stayed. We recommend Chez Max (we walked), Maison Dullet for pastries &amp; all things baked! Walked each morning for pastries &amp; took bread for snack on for the day! Loved Epernay &amp; preferred it to Reims for us to stay.